The American Staffordshire Terrier is a ball of playful energy—with plenty of muscle behind it. They're large, but that doesn't keep an Amstaff from trying to climb into your lap. Friendliness is in this breed's nature—he's loyal and affectionate with family, and civil with new people. Though they look serious and are often laid back, the American Staffordshire Terrier has a perpetual puppy-like personality and loves boisterous play. This strong, sturdy breed is docile when provided enough exercise and attention, but may be rambunctious without. Well mannered and friendly, Amstaffs are eager to please. Early socialization and obedience training are important to prevent struggles that may arise when a small puppy grows into a powerful adult. The American Staffordshire Terrier is also known as Amstaff. Though often referred to as a 'Pit Bull,' the Pit Bull is a type of dog—not a specific breed—that includes the Amstaff, Staffordshire Bull Terrier, and American Pit Bull Terrier, among others. Coat - The American Staffordshire Terrier has a short, stiff coat that may be any color, solid, parti-colored, or patched. The ancestors of the stocky American Staffordshire Terrier—likely descended from the Bulldog and terrier-type dogs—were first used to help butchers manage bulls and as hunters, ratters, and guard dogs. The use of this type of dog in blood sports—bear and bull baiting and dog fighting—earned them a negative reputation. The cruel sports were banned, and the development of the Staffordshire Bull Terrier moved toward that of a courageous, loyal dog meant to live alongside people as a companion. When the Staffordshire Bull Terrier was exported to America, the American type was developed to be larger than the English type. Eventually, the larger American version earned its own recognition as the American Staffordshire Terrier. The American Kennel Club recognized the American Staffordshire Terrier as a breed in 1936. The people-oriented Amstaff is friendly and affectionate, though he has a stubborn streak. But Amstaffs are generally eager to please, and if appropriate boundaries are set right away, they're well-behaved, loyal companions. This is a confident breed with high intelligence, which can be a difficult combination for new owners. They require early, continued training to prevent dominant behaviors—once they're full grown, there's no stopping a strong Amstaff who's tugging on the leash. Are American Staffordshire Terriers Good with Kids? Though the Amstaff is affectionate and mostly gentle with children, homes with older children are better for this strong, energetic dog. Small children may be knocked down or injured during play—and the Amstaff loves to engage in goofy, bouncy play that can be too rough for small children. Are American Staffordshire Terriers Good with Other Pets? Are American Staffordshire Terriers Good with Other Pets? Early socialization with other dogs may help the Amstaff live with other pets—or at least help him greet them politely in public—but the breed is generally not an ideal match for homes with other animals. The American Staffordshire Terrier is a loyal dog who is ready to alert owners of people approaching the door—or of suspicious critters in the yard. While they're good watchdogs, they aren't ideal guard dogs as they are likely to greet a stranger with a wagging tail. They are solidly built and have a big voice, so they may deter intruders regardless of their intent. A moderate energy level keeps the Amstaff going through games of fetch and laps around the yard—but they're often ready to curl up on the couch after a good romp through the yard. Without enough opportunity to burn off their energy, the American Staffordshire Terrier can be destructive and willful. Indoor The Amstaff's favorite way to spend his time is indoors with his family—unless you're heading outside, that is. He'd like to join you there, as well. The American Staffordshire Terrier prefers to be with his pack, so expect him to follow you throughout the house. Though it isn't the ideal living situation for an Amstaff, with enough exercise and attention, he may be able to live in an apartment. Outdoor A fenced yard with plenty of space to run laps is a wonderful place for the American Staffordshire Terrier to burn off some energy. They are likely to wander, so they should not be left outdoors unsupervised. Some research has found that chaining dogs outdoors can lead to fearful, aggressive, or other negative behaviors and it is not recommended for the Amstaff—supervised play in a fenced yard is preferred. They are sensitive to extreme hot or cold weather and crave time spent with people, so this breed cannot live outdoors full time. 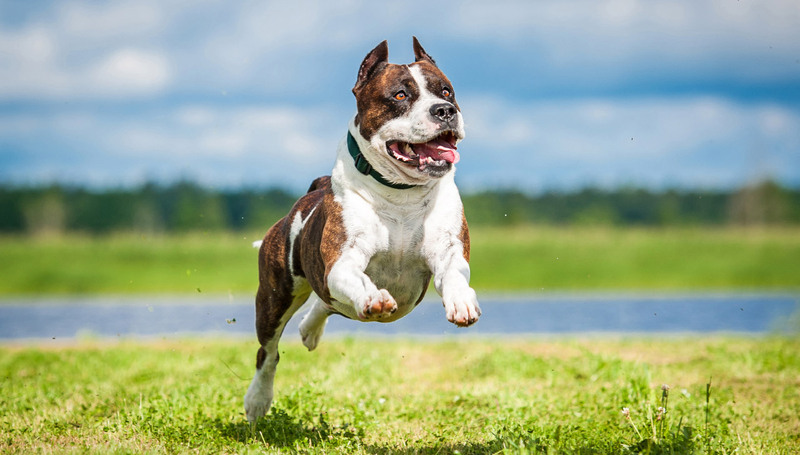 Exercise Daily walks and play sessions in a fenced yard can help the American Staffordshire Terrier get the exercise he needs to be happy and healthy. At least an hour of exercise throughout the day is ideal, though more is better. A well-exercised American Staffordshire Terrier is better behaved while indoors. Endurance Stamina was a quality that was desirable in the early development of the American Staffordshire Terrier, and the breed has plenty of it. They are an energetic dog who loves to go anywhere, and often needs reminders to take a break. Running Miles: An American Staffordshire Terrier may be able to join you for a run of between three to five miles, if well-conditioned and full grown. Working up to longer distances is important to prevent injury. Hiking Miles: Hiking with an Amstaff is a great way to burn off some of his energy. A hike over five miles may be possible, but bring plenty of water. This breed doesn't always know its limits, so it is important to watch for signs that he needs a break. Food The general recommendation for how much high-quality dry dog food to feed an American Staffordshire Terrier is 2 to 2½ cups per day, split between two meals. This amount is based on average weight and activity level. Food guarding behaviors are not more prominent in the American Staffordshire Terrier than in other breeds, but children should never be allowed to touch or remove food while any dog is eating. Alone Time TThe people-oriented American Staffordshire Terrier prefers to spend time with family, but can be left home alone for a few hours at a time. It is best to crate train the Amstaff as they may become destructive if bored or lonely. Though the American Staffordshire Terrier's coat is short and relatively maintenance-free, they do shed a fair amount. Weekly brushing and occasional baths can help cut down on stray fur. Trimming nails regularly will help prevent painful splitting, cracking, or a broken nail. The breed may be sensitive to having his feet handled, so getting him used to nail trimming early is ideal. You can minimize serious health concerns in an American Staffordshire Terrier by purchasing him from a reputable breeder who engages in responsible breeding practices, and through screening for common diseases and conditions. Starting basic training and socialization early is the best way to help an American Staffordshire Terrier puppy become a well-adjusted adult. Priorities in training should be basic manners, including sit, lay down, and stay, as well as a solid recall and leash manners. While the Amstaff is intelligent and well-behaved, the breed displays a stubborn streak. High-impact treats and plenty of praise are the best encouragement for an Amstaff. Agility, advanced tricks and obedience, and Canine Good Citizen training are all great picks for the intelligent, quick-witted, eager-to-please Amstaff. The breed is also used for police work, search and rescue, nosework, and as a service dog. The Amstaff's ancestors were used for hunting and ratting, so you may be able to train an American Staffordshire Terrier as a hunting dog. Is an American Staffordshire Terrier a Pit Bull? While the American Staffordshire Terrier is included in the type of dog referred to as a Pit Bull, the American Pit Bull Terrier is a different breed that shares ancestry with the Amstaff. Though related, these cousin breeds have differences—mainly in size and personality. The American Pit Bull Terrier is not recognized by the AKC, but is registered with other organizations outside of the US.